There seems to have been an explosion in the number of rock duos lately…they come in different setups: guitar and bass, guitar and drums and they differ slightly in genre/output. However, I think it safe to say that there is only one rock duo that also operate an organic farm and supply high quality produce to high-quality restaurants. I also seriously doubt that any other is named after one of the greatest comedy characters ever created. Peter Sellers’ Jacques Clouseau is still a masterpiece of comic timing and the visual ‘gag’. Add in to this that Clouseau was also noted for his unique French pronunciation (Have you seen the minkey?) and that these two are French plus they have been performing for ten years. Put all of that together and we start to see the sense of honesty in their music and the principles of life they hold dear, but all approached with a great sense of humour. Laurent Lacrouts and Mathieu Jourdain are the duo in question, although they operate under the aliases of Malcolm and Phil playing guitar and drums respectively and extend their humour based on that setup to the name of their own label…Fuckthebassplayer Records! 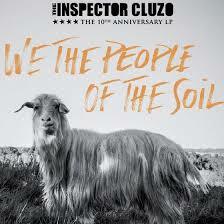 They are The Inspector Cluzo and have recently released an album (their sixth) reflecting on their world of farming, humour and music called We The People of the Soil. The first track explains that last sentence…A Man Outstanding in His Field shows the influences too: how about some country mixed with blues-rock in the old tradition? Well here it is with a fabulous riff bringing in the drumming as we have spoken word verses on farming and a soprano chorus before growling vocals finish the chorus. It is a strange mix that leads to surprise keyboards and a decent guitar solo…it is also engaging. The Sand Preacher starts with, and has intermittent acoustic patterns, interspersed with electric chords from guitar and keys. More spoken words mixed with sung vocals again work despite the REM sound to the verses. Cultural Misunderstanding is a cute strummed acoustic and yet more spoken verses with melodic choruses. The instrumentation is an almost orchestral country when all of them join in…although I don’t know who plays the sweeping keys. To get a measure of this, think of The Darkness playing Johnny Cash…but with Justin reigned in a bit!! Ideologies combines acoustic and electric again with an offbeat percussion that should sound awful…but most certainly doesn’t; in fact when the electric switches to slide it gains gravitas. Little Girl sounds like an Ennio Moricone intro, complete with the ubiquitous whistling, before it gains some weight with keys filling the sound and the drums playing a simple but effective part. We The People Of The Soil is the best, most measured vocal performance and the whole song takes on a more standard format. It has a great backing of electric chords over the keys. No Deal At The Crossroads suggests that Robert Johnson is in their musical palette: what we get is a rapid acoustic over keyed strings that show more country than blues, although the story is connected, it is in word only. Next up is The Best; a song with a guest appearance on vocals by vocalist Marianne Dissard…she was in a band called Calexico. Here she duets effectively over simple acoustic picking and strumming before the drums and electric cut in. Pressure on Mada Lands (no, me neither) is the best one for me as the intro of phased and echoed guitar over heavy percussion is surely a Hendrix inspired piece and the closing (and the only proper guitar solo…shame!) is excellent. The Globalisation Blues starts off all psychedelic with a great riff and drum/guitar interplay and develops into an almost Foo structure…it’s not blues but still a decent rock song, especially after the false ending. Final track, Brothers In Ideals, again alludes to the err…brothers ideals. It is a laid back song all the way, with acoustic picking behind the semi-spoken vocal, sounding very Lou Reed, over strings and subtle snare. A violin/cello solo actually adds to the warmth of the song and the story behind it. This is really difficult to summarise; part of me thinks I shouldn’t like it…after all Justin Hawkins singing country and folk-inspired rock would be thrown out immediately. Yet there is a charm and likeability that runs through every note on this album. No there aren’t guitar solos to lose oneself in; there are no true blues or heavy rock songs here but it is one hell of a lot of fun and I really enjoyed hearing these guys for the first time. I would bet they are even better live. So if you want some rocking, folky country, then this is a blast!